I received this set as a gift from my little husband. It's even better than what I had expected. It is very classy, the size of the pearls is really amazing. I'm so happy to wear this beautiful and impressive necklace! Indulge your dark side with giant Tahiti Black Peacocks! During a recent stay in Tahiti, I watched veteran pearl divers at work. And I realized that growing a perfectly-shaped, perfectly-smooth giant pearl inside one of the enormous Pinctada margaritifera oysters is still hit or miss. The complex process of culturing takes years and all the expertise in the world doesn't guarantee that nature will deliver. That's why we began a quest to create a near-perfect scientifically created pearl using the exact same materials as Mother Nature herself. After years of searching, we found brilliant bio-scientists who harvested the finest mother of pearl (or nacre) from some of the world's most exceptional oysters. This costly material is then shaped, organically hand-coated and meticulously hand-polished into a spectacular sphere of iridescent color. The resulting black beauty is more round and radiant than world's most exclusive, luxury-priced cultured pearls. 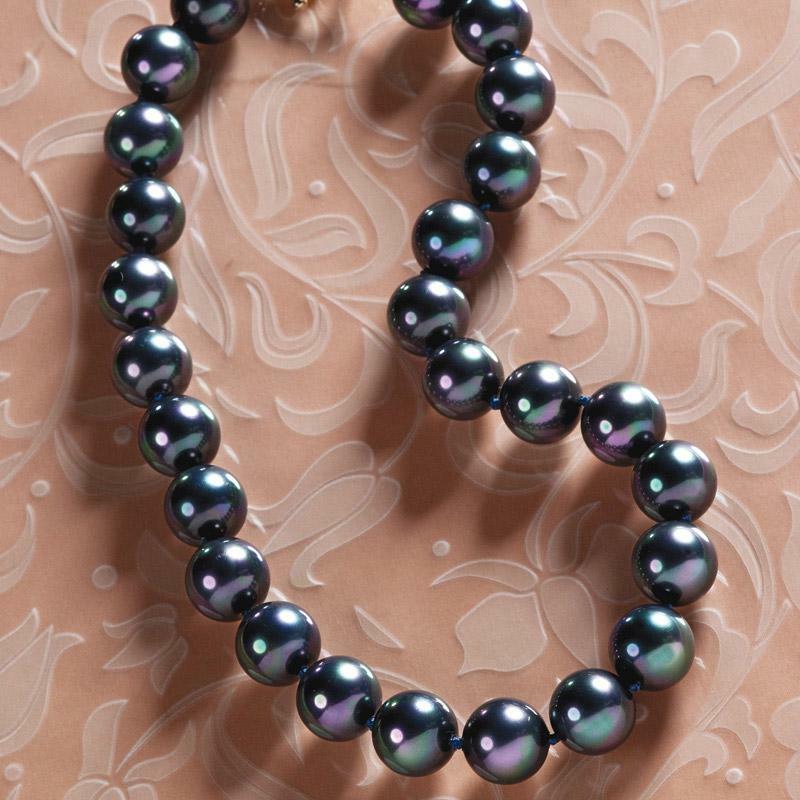 A equal-sized strand of genuine black Tahitians this size would be extremely rare and cost a small fortune. 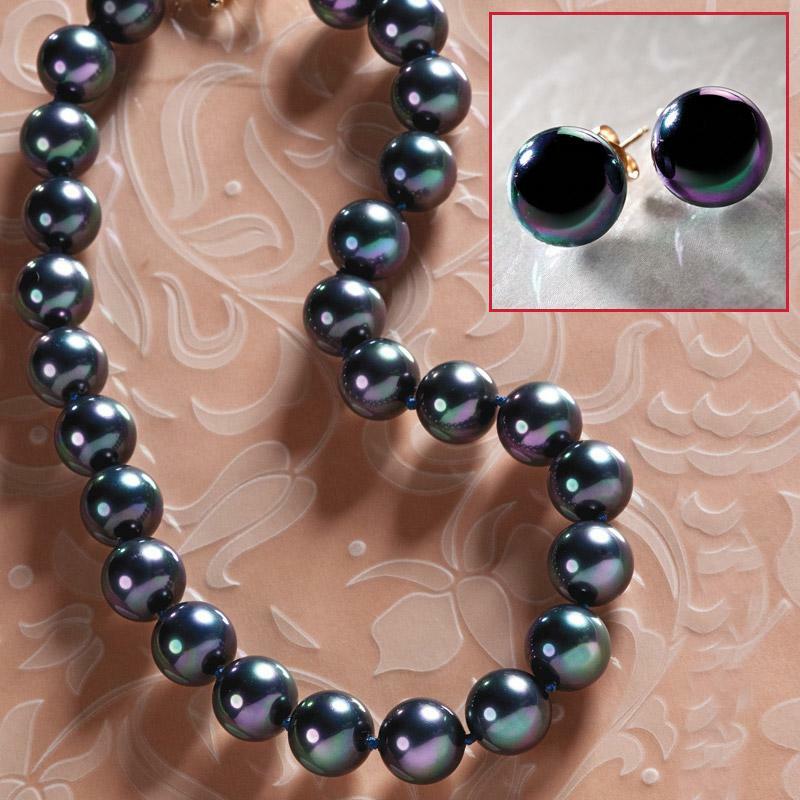 By speeding up and taking control of the process, we created our Tahiti Black Peacock Necklace & Earrings Set, a stunning strand of consistently round and luminous Tahiti Black Peacocks. The 16" necklace plus 2" extender features exceptionally large 14mm spheres and is hand-strung, double-knotted and secures with an elegant, gold-fused toggle clasp. 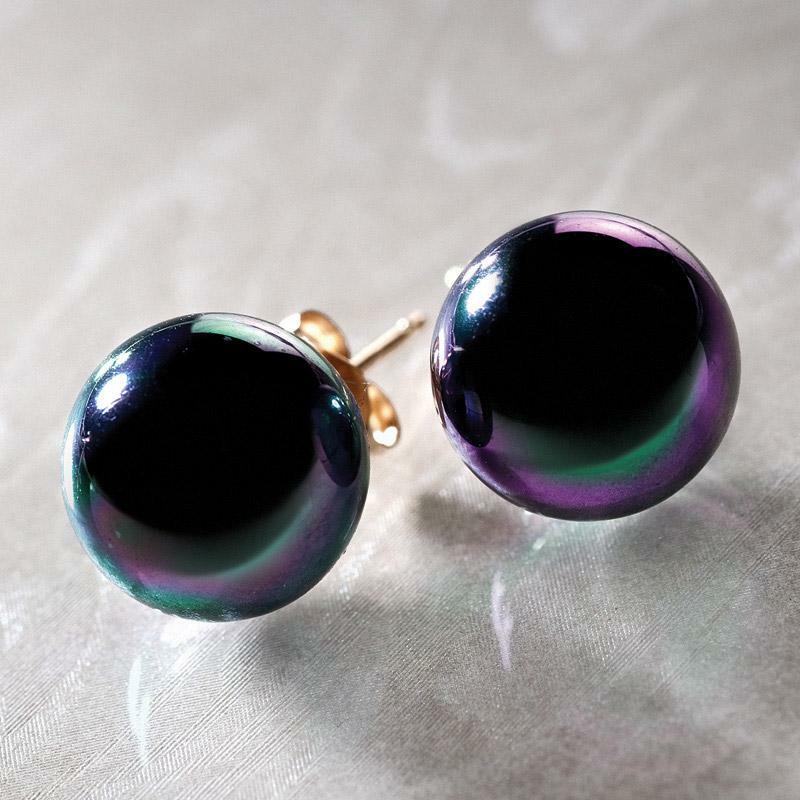 The Pacific Black Peacock Stud Earrings are 10mm each. Bothe the necklace and earrings capture the vivid luster and heavyweight feel without the exorbitant cost. Our Tahiti Black Peacocks are also more durable and less porous for better wear. The Tahiti Black Peacock Necklace & Earrings Set is the must-have accessory for those romantic nights that keep you out long after dark!